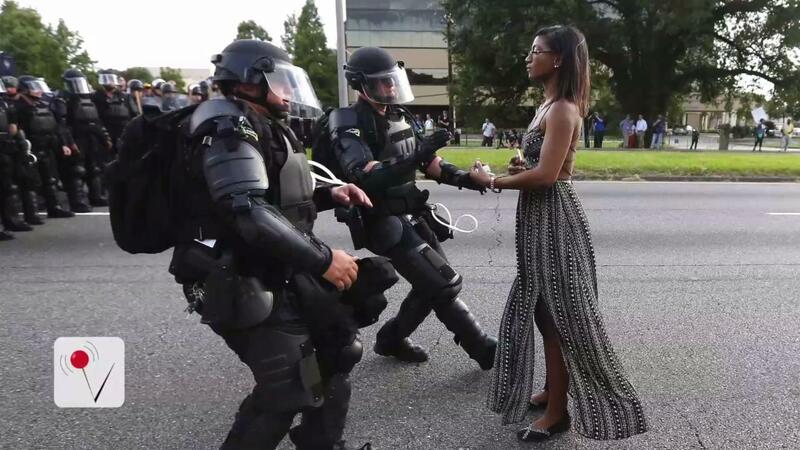 Ieshia Evans, the woman who was captured in a photo facing down Louisiana state guards during the protests in Baton Rouge this past weekend, has broken her silence on the face-off, saying in a statement Tuesday night: "It's time for us to be fearless and take our power back." Evans, who traveled to Baton Rouge with the civil-rights organization Young Minds Can, added that she felt police "were pushing us to the side to silence our voices and diminish our presence." "When the police pushed everyone off the street, I felt like they were pushing us to the side to silence our voices and diminish our presence," Evans said. "They were once again leveraging their strength to leave us powerless. As Africans in America we're tired of protesting that our lives matter, it's time we stop begging for justice and take a stance for our people. It's time for us to be fearless and take our power back." A release accompanying the statement noted that Young Minds Can, which according to its website aims to "help repair, unify and free African American people (New Africans) through education, ownership, nationhood and self determination," transported nearly 30 people from Atlanta to Baton Rouge, at the invitation of the New Black Panther Party of Self Defense. During the trip, the group visited the Triple S convenience store, where police-shooting victim Alton Sterling was killed, and demanded justice outside of the police station. "Although she didn't intend to, Queen Ieshia had a 'Rosa Parks moment' caught on camera that has undoubtedly inspired a generation and made us all proud as African people in America," Young Minds Can founder Jay Morrison said of the photo. "We've been powerless for too long under America's watch, it's time we recognize our independent strength and begin to take our power back." Since the photo, taken by Jonathan Bachman and published by Reuters, went public, it has been praised for its powerful portrayal of strength, courage and poise in the face of authority. "Resembles famous one of Tiananmen Square protests," one Twitter user commented. "This is a legendary picture. It will be in history and art books from this time," another Twitter post marveled. "No words necessary," another admirer offered. On Monday, Evans acknowledged the impact of the moment and photo, tweeting, "This is the work of God. Im a vessel,Glory to the most high! Im alive and safe. I have not witnessed any casualties."